He may only be 24 but Edinburgh City defender Bradley Donaldson has had a tough time of it. Once tipped to make the grade with boyhood heroes Hibs, the player’s career has been on a downward spiral ever since his release from the Easter Road outfit in summer 2014. Ravaged by injuries, not to mention contracting a life-threatening case of septicemia, he’s found game time difficult to come by at Livingston – who he joined upon his departure from Hibs – Cowdenbeath, former Junior clubs Linlithgow Rose and Musselburgh Athletic, and current side Edinburgh City. He’s had to contend with so much uncertainty that he’s even had to plan for life outside of football where he now works in finance and IT for Aegon. 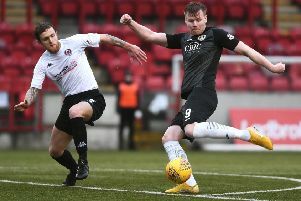 But Donaldson can now see light at the end of a very long tunnel and he hopes to cap it off with a Ladbrokes League Two winners’ medal in a couple of months. 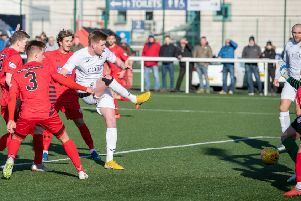 The player was thrilled to make his first league start of the season in Tuesday night’s 1-0 win over Berwick Rangers having only recently returned to the fold following an ankle problem. Ahead of tomorrow’s visit of Queen’s Park, Donaldson said: “It was really good to get a game this week having been out injured for a while and only coming back into the mix around Christmas time. “I’ve only started one bounce match so far this year so it felt good being out there again. You need games to get yourself up to speed. “It’s been difficult trying to get back into the team because of the form we’ve been in but that’s part and parcel of football. You just have to accept it. But my body feels great after the 90 minutes on Tuesday so I’m hoping to play some more now. “I really can’t explain how happy I was just to start. I want to have a part to play between now and the end of the season. If I can get more starts and game time then great. But it’s all about the squad and the gaffer will pick a team that he thinks is right. With just nine games left to try and overhaul Peterhead’s five-point lead at the top, Donaldson accepts they can ill afford any more slips ups. And he admits he would relish the opportunity to be playing League One football next season as he continues to rebuild his career. “When you get to the business end of the season, getting the three points is what counts. We’re not at the top of the table anymore so all the pressure is now on Peterhead,” he said. “My ambition is still to get back into full-time football at some point. I enjoy what I do in finance but when I compare it to what it was like when I was at Hibs or Livingston, nothing really beats full-time football. It’s a no-brainer. “I think when you’re coming through as a young lad and you’re getting a game, I don’t think you ever envisage having to drop down to part-time as you’re living in the moment. You never think anything is going to go wrong.